Blonde and bronzed, young Sanoa Olin catches a wave that lands her every competitive surfer’s goal: a perfect 10. She’s only 11 herself, but her skill is far beyond her years as she links together several committed turns on her native Tofino waves. It’s not long into the final round of Princess of the Peak under-16 surf contest, part of the Queen of the Peak all-female championships, but it quickly becomes clear that Olin is the runaway winner. Rather than rest on her perfect 10 score, though, she keeps paddling back in, riding the waters, standing up on her board, controlling it with incredible athleticism. As the announcer counts down the end of the heat, Olin grabs one more wave—a humble victory lap—and rides it all the way to shore. 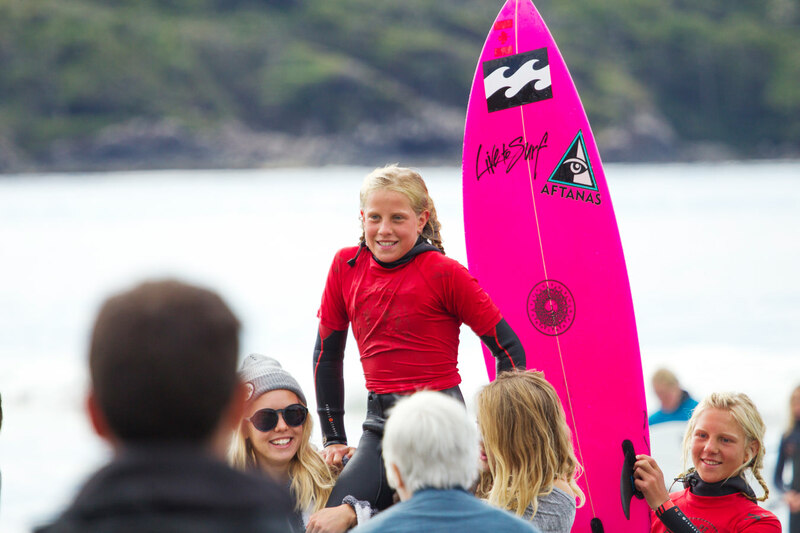 The crowd that has gathered on the sand of Cox Bay Beach cheers as Olin’s sister Mathea, also a competitive surfer who went on to win the competition’s longboard final, grabs her pink surfboard. Two friends lift her up on their shoulders, carrying her across the beach and not letting her feet touch the sand until she has been crowned the Princess. 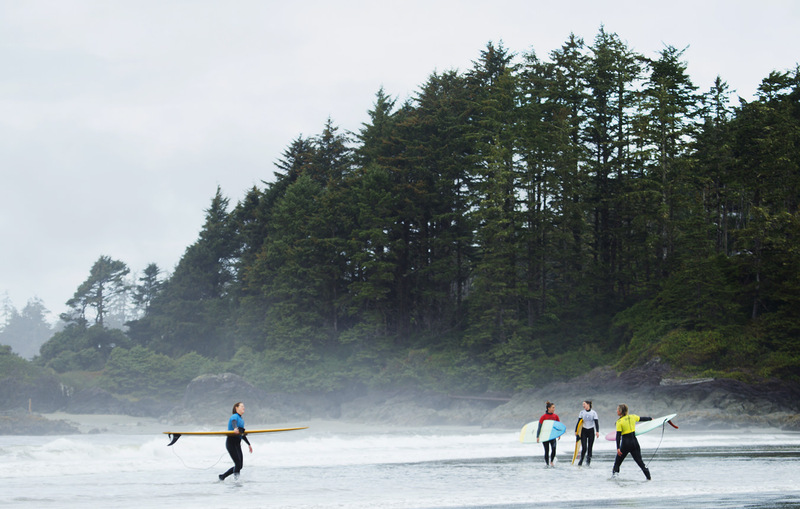 People come from all over the world to surf in Tofino’s cold waters, but the conversation usually surrounds its conditions, not its community. The latter is what is important here, though—there’s no ego in these waves, and a lot of it has to do with the ladies. 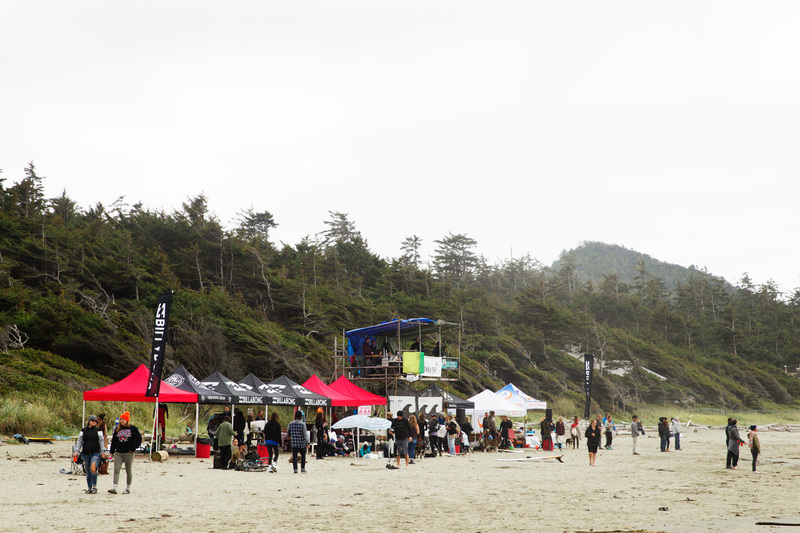 Queen of the Peak was created in Tofino seven years ago as an answer to the unwelcoming vibe of co-ed surf competitions and the usually way lower prize money offered to female winners. 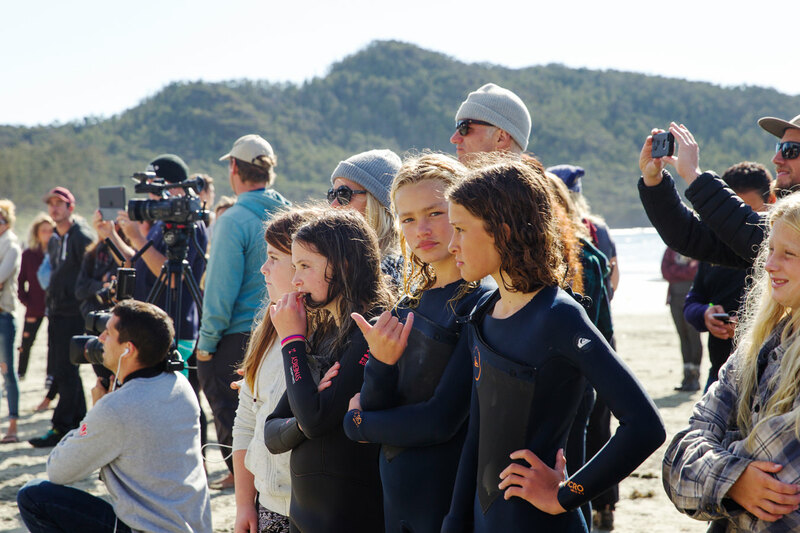 Co-founded by Krissy Montgomery of Tofino’s Surf Sister school (which operates its second location out of Pacific Sands) and Shelter restaurant’s Mike Jacobsen, Western Canada’s only all-female surf contest is about just that: the females. “Each year it just snowballs,” Montgomery says to a group of assembled guests at the Wickaninnish Inn on the first night of the contest. While year number one saw 40 entrants, 2016’s version had over 100, including contestants from California and across Canada. 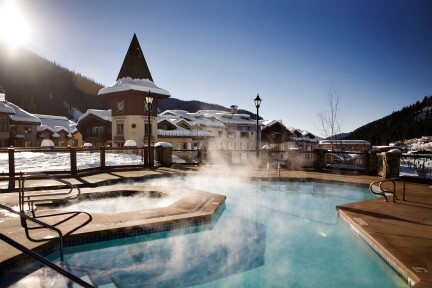 And no wonder: aside from the chance to hang 10 in what is consistently considered Canada’s surf capital, women can also take advantage of the onsite perks such as free daycare for their little ones, free massages from Wickaninnish Ancient Cedars Spa staff, and even a hot tub—made out of a former beer brewing tank—to keep athletes warm after their time in the ocean. “It takes a lot of effort to get out here—even from the mainland, never mind from California,” says Richards. “So it’s awesome. This is a weekend event, but I think it’s definitely instilled into the rest of the year. The amount of surfboards we see—the women have helped change the face of the surf industry here. We see lots of generations: grandma and grandpa, mom and dad, and little kids all learning to surf together.” Surf Sister is a big part of that year-round, and Pacific Sands is happy to play host to the school’s surf shack, which is conveniently located next to the newly opened Surfside Grill, a sister restaurant to downtown Tofino’s beloved Wildside Grill. Situated right on Cox Bay, Pacific Sands offers the ideal place to stay for those wanting to watch Queen of the Peak unfold; though just steps from the excitement, the property’s bright and cozy beach houses do make it hard to leave, and lazing in bed to the sound of the waves lapping on the shore is luxuriously tranquil. But the water beckons. “I think so many people are apprehensive about trying surfing because of the ocean and the fear that it holds, and in addition to the bravado that’s historically been associated with surf, it increases that hesitation,” Richards says. 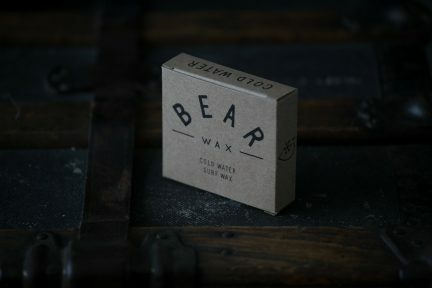 “I think girls really have helped soften it and introduce it to men and to women with different lessons that have really increased people’s interest in doing it. 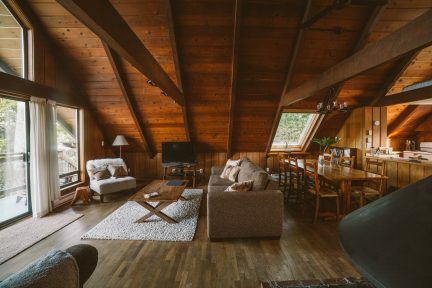 All of us resort owners are surfers, so we would really like to share that with people and get as many people into it as possible.” Whereas in some cities surf culture is one big competition, a scene to be seen in, Tofino breeds camaraderie just as quickly as it does talent. Even in the adult heats during Queen of the Peak, it is common to see competitors chatting and laughing before their round, and hugging when the results are announced after. 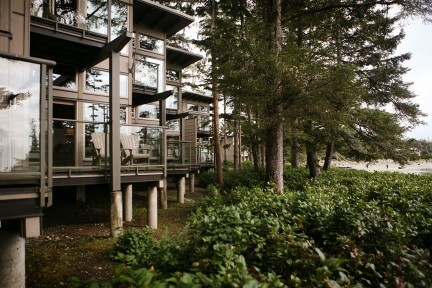 On the final day, Montgomery walks up from the beach to Long Beach Lodge Resort for a quick break. “Yesterday we were standing there shivering, asking ourselves, ‘Why do we do this?’” she says with a smile, referring to the previous day’s treacherous downpour. “And then today we were like, ‘Oh yeah, this is why.’” It’s nothing but blue sky and sunshine, and the scene is certainly postcard-perfect as babies play in the sand, adults stand watch with their coffees, and the Queens ride the waves. Montgomery jokes that she does it for the weather, but really she does it for girls like the Olin sisters, who just before returning home to compete in Queen of the Peak were in the Azores, Portugal representing Canada at the Vissla ISA World Junior Surfing Championship. But Montgomery also does it for the soon-to-be surfers, such as Richards’s daughter, who runs around the beach in her little gum boots, and the small baby girl, barely old enough to walk, who squirms out of her mother’s arms and toddles to the edge of the tide. She bends down and puts her fingers to the ground as a wave rolls in. She just wanted to touch the ocean. Purchase your copy of our Winter 2016 issue now.